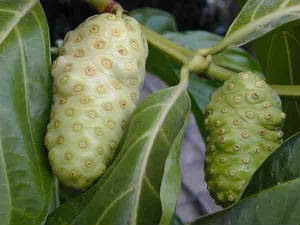 Noni is a fruit from Indonesia. Noni fruit is oval-shaped, and there are green dots - tiny brown spots all over the skin. It was indeed a bit uneasy, but the noni fruit has tremendous benefits for health. Ascorbic acid is in the Noni fruit and is a rich source of antioxidant vitamin C to fight free radicals. It also contains caproic acid, caprylic acid and capric acid which belong to this class of fatty acids. Caproic acid and capric acid that cause the sharp stench of Noni fruit. Scopoletin substances. These substances have medical benefits and can bind to serotonin (a chemical important in the human body). Scopoletin is also useful to widen the channel of the blood vessel constriction and blood circulation. Additionally scopoletin can kill some types of bacteria, are fungicides (mold killers) against Pythium sp and also anti-inflammatory and anti-allergic. Xeronine and Proxeronine. Xeronine controls the shape and rigidity (hardness) specific proteins present in the cell. Morindon or Morindin (red color on the skin giving the plant Morinda citrifolia). Ingredients: 2 Noni fruit (ripe on the tree), 1 tablespoon of honey. Method: Squeeze the noni fruit, take the juice and mix with honey until blended. Filter. Method: The second material is boiled with 2 cups water to a boil. Allow it to shrink 1 cup water, then filtered and drunk. This herb can be taken 2 times in 1 day, morning and afternoon. Method: noni leaves finely, and add salt and poured boiling hot water. Strain and drink when cool. Well .. so last glimpse of the noni, good luck and hopefully useful.